Despite the fact that the weather outside in Dearborn Heights, Michigan is absolutely freezing, the experts at Downriver Roofers are on call 24/7, year round to handle roofing repairs, roofing maintenance, and new roof installation. We don’t mind climbing a roof in subzero temperatures, because we know how important it is to take care of roofing issues no matter what the weather is like. For more than 20 years, our highly skilled professionals have been serving customers in the Downriver area, and continue to be top rated in Quality, Performance, and Service. We are the #1 roofing contractor in Dearborn Heights, Michigan, and pride ourselves on providing the most affordable, exceptional roofing services you can find. Free commercial or residential roofing inspections – both interior and exterior. We carefully examine your roof for holes, wear and tear, missing shingles, water damage, snow damage, hail damage, and wind damage, and develop a customized plan just for you. 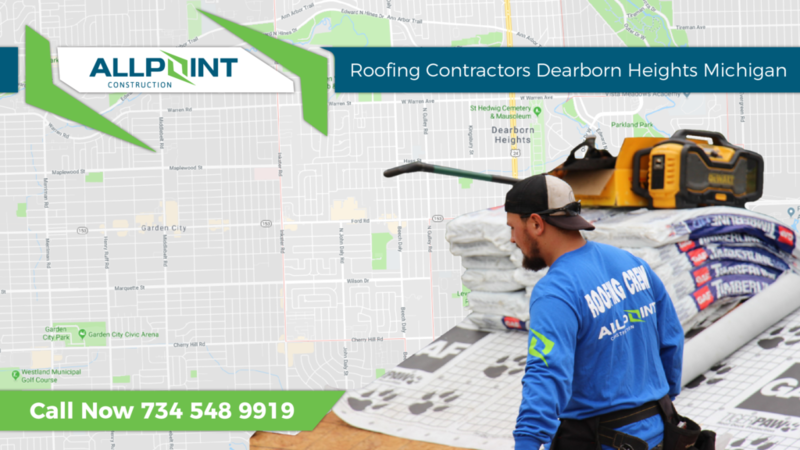 Owner on site – our business owner oversees every roofing project in Dearborn Heights, Michigan, no matter how large or small. He is always available to take your call or answer any questions you may have. No-leak guarantee – our roofs are strong and built to last – with no leaks, and that’s a promise! Typical one day installation – our new roofs can usually be installed in just a day on average! Lifetime warrantee – we stand behind every new roof we install forever! Affordable financing programs – we are here to help you find a roofing solution that fits within your budget. Insurance claims processing – our administrative professionals will help you fill out any insurance claims paperwork if you are eligible for a home or business owner’s claim. If you live in Dearborn Heights or any city in Downriver, MI give us a call at 734-548-9919 and we will take care of all your roofing needs. We are fully certified, licensed, and insured, so there are no worries. Visit our website at www.downriverroofers.com to learn more, and check out our Facebook and Twitter pages. We look forward to serving you soon!